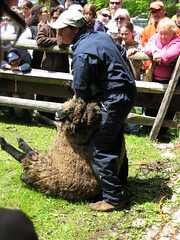 it wasn’t Maryland, but Huntington had its own, lovely Sheep to Shawl Festival here on Sunday. And what a glorious day it was! First off, the weather, which was supposed to be gray and rainy was anything but. It was sunny & glorious! Many Long Island guilds participated, including my own favorite spinning guild. Also present were the rug hookers, bobbin lace makers, knitters, tatter (almost said taters!) and weavers. Live music was provided by a trio of musicians and there were pony rides, antiques,food and lots of general gaiety. I even managed to learn some drop spindling techniques! I really enjoy doing spinning demonstrations at these festivals. What a great way to spend the day – spinning with friends! One of our guild members, Tabbethia is a professional shearer/alpaca and llama breader and shower and here she is giving one of three demonstrations. So keep this in mind for next year – if Maryland is too far, Long Island is right here! I was toying with going to the sheep to shawl this past weekend but I was too lazy, lol! I’m jealous. It looks like it was a great day. Too bad that’s at least as far as Maryland for me. It sounds like a really nice little festival and a great way to kick off Spring.